The Songora or Shongora (pl. Basongora, sing. Musongora) are also known as Kama [BaKama], Huma [Bahuma] and as Chwezi [BaChwezi or BaChwa]. Some other names given to Basongora in commentaries of explorers, missionaries and researchers include: Bagalla, Bazongora, Barondagani, and others, some of which are derogatory or of uncertain origin. Basongora are traditionally a pastoralist cattle-herding cultural community located in the Great Lakes Region of Central Africa, primarily - but not exclusively - in what is now western Uganda and eastern Democratic Republic of the Congo. Basongora have distinctive pastoral customs that include the breeding, bleeding and milking of African longhorn cattle. Several noted, but endangered, breeds of long-horn cattle - including the Ngondo, Nyambo and Ngombe - were bred in Busongora. The Basongora are not nomadic, despite claims to the contrary. Nomadism implies that a group entirely abandons one location and moves to another. Basongora have never abandoned Busongora. In pre-colonial times the young men and women would travel with the cows, but they always leave the elderly and the children at home in Busongora. Travelling herders always return after a while to rejoin their families. Basongora women are held in great respect, and the men make decisions on the advice of their women. It is taboo to raise one’s voice in anger or impatience when speaking to a woman. Basongora are one of the world’s few cultures that practice multilateral descent - they inherit through both the male and female ancestors. In the pre-colonial era, Basongora were famed as priests, prophets, mandarins and warriors, and continue - even in modern times - to be perceived as talented administrators and commanders. From ancient times BuSongora was an important part of the world, and was incorporated into several of Africa’s largest and most powerful empires. The land of the Basongora was known to the ancient Kushites, Egyptians, Phoenicians and Greeks as “The Land of the Moon”, and is the location of the spectacular “Mountains of the Moon” [the Rwenjura Mountain Range - erroneously misspelled as “Rwenzori” by Henry Morton Stanley in 1888]. The western arm of Africa’s Great Rift Valley also runs through Busongora. Busongora also features several rivers that are sources of the Nile, as well volcanic lakes, explosion craters, underground rivers, ancient forests, and much more besides. Basongora are traditionally monotheistic, and the culture consists almost exclusively of ancient court rituals and customs that attended protocol in the palaces of the ancient Kushites, the ancient Axumites, and the ancient Shenzi [Zenj]. Modern Basongora today are the last indigenous remnant of the royal families, military elites, nobility, courtiers and priesthood of the fabled Chwezi Empire, as well as of the ancient empires - Kush and Axum - that ruled Central Africa over the past centuries. Throughout history Busongora sent envoys and settlers to every part of the planet, and in turn Busongora was visited frequently by travellers from as far afield as Europe and China. The most ancient name by which the Basongora community was identified is “Kama”, expressed in Rusongora as “BaKama”. It initially meant “those who milk”, in reference to cattle-rearing. Eventually, however, the BaKama came to be associated with kingship and came to dominate the earliest civilization in Africa, which is known as the Bovidian Era. In fact it is from the Kama that we get the names Kem, Khem, and biblical Ham, that all came to refer to the original name for all of Africa including Egypt. The name “Egypt” is a recent innovation by Greeks who first appeared in Africa in 1400 BC. Whereas the verb “kama” means to milk a cow, these days the noun “Kama” is exclusively used to mean “a monarch”. We do not yet know the names of the original pre-Ice Age kingdoms which predate the Kama state. Stone tools and fossils, provide evidence that BuSongora was inhabited by humans as early as 1,000,000 years ago. The earliest transcribed event in BuSongora that has been dated - so far - is the 25,000-year old Ishango Bone. The bone was unearthed on the shores of Lake Rueru [L. Edward] in BuSongora. The Ishango Bone is a sophisticated calculating aide with inscriptions that consist of three columns of stacked numbers. The existence of the Ishango Bone indicates awareness of complex mathematical principles, philosophy, as well as advanced knowledge of crystallography and prognostication. 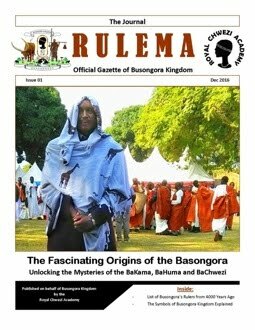 The post-Ice-Age Kama kingdom, which is recorded to have been centred in Busongora about 10,000 years ago, is without question the first kingdom in recorded history of the world. Ancient scribes and modern scholars have given us the names of some of the rulers of that time... including Warusiri [known in European texts as Osiris or Ausar] and Mukama [known as in ancient Asian texts as “Am Kaam”], as well as others who have been deified and now make up the entire cohort of early gods in Kush, Egypt, Mesopotamia and Europe. Studies by notable archaeologists and historians all attest to the fact that Busongora became the origin of all of Africa’s post-Ice-Age civilizations, as well as several other related civilizations in other parts of the world. Diodorus Siculus - writing in 50 BC while visiting Sudan - claims that Africans living around the ‘Mountains of the Moon’ had sent out - at the end of the Ice Age - under one Osiris, a great army "with the intention of visiting all the inhabited earth and teaching the race of men how to cultivate ... for he (Osiris) supposed that if he made men give up their savagery and adopt a gentle manner of life he would receive immortal honors...". The names “Asr”, “Ausar” and “Osiris” are the Asian, English and Greek renditions of the Rusongora name “Warusiri”. In Swahili and Arabic this name is rendered as “Wazir”, and in Luganda it is rendered as “Walusimbi”. There are two famous persons named Warusiri in Busongora’s history. The first Warusiri mentioned by Diodorus and by ancient Egyptian priests lived about 8,000 years ago. It is that Warusiri from whom is derived the name “Mizraim” or “Misiri” - the other name by which Egypt is known [it is also known as “Kemet”]. The name Mizraim originally meant “Followers of Warusiri”. The second and more recent historical personality named Warusiri was a Musongora prince whose full name is “Ganda Warusiri”. This later Warusiri helped in the founding of the Kingdom of Buganda - which is named after him, and it is his name that is the origin of the name of the state of Uganda. The root for the Rusongora name Warusri is “si-ri” which breaks down as “of earth”, and implies a garden or a paradise. The preffix “ru” implies the male gender and/or “largeness”. So then Warusiri should translate as “he of the beautiful earth”. About 7000 BC, the highly sophisticated pre-Ice-Age culture of Warusiri in Busongora - which had survived the thawing of the world’s glaciers - suffered a massive volcanic cataclysm and was destroyed. Evidence of this cataclysm is still visible in the hundreds of explosion craters [e bi-korongo] of BuSongora and neighbouring regions. BuSongora had survived both the catastrophes occasioned by the start and the end of the Ice Age, but was not to be spared the subsequent volcanic and tectonic failure. Many of the survivors fled northward and created a new centre in Sudan, and later on in Egypt. They took with them to these places an already fully developed system of government. All of the essential elements that constitute ancient Kushite and Egyptian civilizations were fully developed long before the emergence of the first dynasties in these places. Their spiritual beliefs remained fundamentally the same as they had been at time of the cataclysm in Busongora They looked backward in time to an ancient golden age in the “Land of the Moon”, which remained their point of cultural reference for many centuries. The Egyptian scribe Manetho of Sebennytus explained in 275 BC that the Egyptian kingdom emerged from an array of small city states, each ruled by a hereditary king. There were about 40 of these city states. They had been formed over the course of 2000 years - between 7000 BC and 5000 BC. Eventually these states were unified to create two states - one based around Thebes in the South and the other centred on Memphis in the north. In 3100 BC the two states were unified by the pharaoh named Aha who was from the south. Prior to the rise of Aha, Egypt’s two states were vassals of the Early Kushite Empire with its capital at Qustul in what is now Nubia. In 3800 BC the pharaohs buried at Qustul in Kush had fully-formed and stable ideas about management of government, and about the rites required in the performance of their duties on behalf of society. Moreover, the cultural milieu in which they grew was one which had cattle as its primary source of organizational, economic, spiritual and cultural vitality. The graves of the pharaohs at Qustul were surrounded by the graves of cattle. Thus architecture, trade, mining, hunting, fishing and agriculture functioned only as auxiliary systems of servicing and augmenting the primary cattle complex. Another old name for Basongora is “Huma”, and is associated exclusively with long-horn cattle and the processing of iron. Long-horn cattle were from the earliest times associated with iron-smelting rites, and thus the name for those cows may have been transposed onto the smelting process, and eventually to the metal product itself. Thus the word for metal prong or fork is also “huma”, and the old word for iron in east and central Africa became “huma” - or its variants such as ‘chuma’ ‘kyoma’ and ‘uma’]. The thing that ties together these diverse meanings for the word “huma” is the fact that both these special cattle and the iron-smelting process, were initially associated with priests who managed the cow-sacrificing rites that took place at the iron-smelting sites. In due course the people associated with these ritual practices involving “cattle, divination and iron” became known as “BaHuma” - literally translating as “People of Iron”. This connection with priesthood is born out by the fact that the routines and taboos - such as abstinence from rich foods, and the prohibition against eating fish, insects, meat - as well as use of a highly ritualised moon calendar, which constitute the customs of the “baHuma”, are all rites ascribed to the ancient priesthood of Kush and ancient Egypt. The priests in Egypt and Kush didn’t create these taboos and rites relating to food or smelting, but rather were following established tradition that predates the founding of Egyptian Civilization. Records left by Egyptian scribes dating as far back as 2300 BC, claimed that the founders of various Egyptian dynasties up to that time came from “the foothills of the Mountains of the Moon”. The scribes also claimed the ‘Land of the Moon’ was home to the god Hapi – the Egyptian and Kushite god of cattle and water – indicating that at that time and prior, intensive cattle-rearing was already established in Busongora, before it spread to Sudan and Egypt. Moreover, ritual cattle culture is attested as far back as the start of the Holocene Era [10,000 BCE] when cattle burials, kraal building and other customs associated with long-horn breed of cattle became common, and possibly as early as 50,000 years ago - when it is said that a mutation in the human genome allowed some Africans to start digesting cow milk. Clearly then the people who lived in Busongora at the dawn of recorded history had a great impact on the subsequent evolution of the African civilization. The priestly portion of the traditions they left have survived as BaHuma culture in Busongora, and it spread to other parts of Africa and gave rise to sacred kingship rites involving long-horn royal cattle, moon-veneration, divination, and iron production technology. There are several dynasties in Kush and Egypt whose organization and legitimacy were notably contingent on maintaining herds of sacred longhorn cattle - including all the dynasties that fall under the Kerma Era, which lasted from 2500 BC to 1500 BC. The Kushite Empire that ruled Busongora and the rest of Africa from about 3800 BC to 3100 BC, and then again from 2300 BC to 330 AD, had the greatest legacy in terms of culture and languages. In Rusongora, the name “Kush” has many related terms, but is enunciated as “Kookyi” and also as “Kasha”. The personal name Mukasha or Mugasha [Mukasa in the Luganda dialect] translates as “the Kushite”. Other personal names or function names, such as Mukushi, Kasa, Nkusi, are all variants or the name Kush, or have as their root the name Kush. The Kushite imperial administrative centres in Busongora - and elsewhere in the GLR - still retain the name Kush, or its variants, such as Kuch, Kookyi, kasha, kus. Kush, is the source of the name for Rukooki sub-county in heart of old Busongora, as well as for the another kingdom - Kooki - located in south-west Uganda. Beginning in 330 AD, the Axumite Empire gained control of Central, Eastern and Southern Africa, replacing the Kushite Empire in those regions. The traditional oral narratives of Busongora are rich with information about the origins and deeds of the “Tembuzi” Dynasties [the word Tembuzi comes from “tembu’ra” meaning “to found” or “to arrive early”]. The Tembuzi narratives are inclusive of all of the dynasties that came before the current and last dynasty - the bachwezi. The Tembuzi are inclusive of the Kushites and the Axumites and the Shenzi Dynasties, as well as prior dynasties. The monument also stated that the people at the base of this snowy mountain - westward across what is now the Victoria Nile - had told Aphilas that they were independent and had never been conquered by outsiders, until he arrived. The people at the base of the Rwenjura Mountains [Rwenzori] must have understood themselves as the natural citizens of the Kushite Empire, with a sense of entitlement that the empire was their nation, as opposed to a foreign imposition or an illegitimate power. That is why they told Emperor Aphilas that they had never before been conquered by outsiders. At the height of its power, Axum was regarded as the third of the four greatest powers of its time, after Persia and Rome, with China being the fourth. The empire’s initial capital was Zula [Adulis] in what is now Eritrea, but it later shifted to the city of Axum in what is now Ethiopia. Zula initially became great around 100 AD when a port city of the Kushite Empire. It gained autonomy in 300 AD when its governor revolted and overthrew the Kushite empire. A few years later the new empire moved its capital to the city of Axum. For the next 300 years Axum controlled all of east, central and southern Africa. The name Axum breaks down as Ak-Shum, which originally meant “water lords” or “sea lords” in the Agaw language of northern Ethiopia - from which many of the languages of Eritrea and Ethiopia are derived. Alternatively, the name “mai-shum” was used instead of Akshum. The word “shum” originally meant ‘lord’ or ‘chief’. The name for the Axumite governors and commanders has survived in Rusongora as “BaShuma”. The word “shuma” and its variants such as “suma” and “suba”, later came to acquire a negative meaning. In the languages of the Great Lakes Region of Africa, “Shum” forms the root for various related words with meanings that include: ‘buy’, ‘raid’, ‘go southward’, ‘come down’, and ‘take without permission’. All of these terms and phrases are reflective of the feelings associated with imperial rule of the Axumites in Central Africa. In 630 AD, the empire declined precipitously on account of the instability generated by the rise of the Islamic Caliphate, and war with the Nubian Federation, as well as the emergence of the Shenzi Empire. Axum lost its imperial territories in Equatorial and southern Africa to the new Shenzi Empire. However, Axum remained a powerful kingdom - but confined to North-East Africa, in the territory now covered by the modern republics of Somalia, Ethiopia and Eritrea, as well as parts of northern Kenya - until 960 AD when it was conquered and utterly destroyed by “a southern pagan queen” who is known as ‘Gudit’ or ‘Judith’ in modern Ethiopia. Conventional explanations proclaim Gudit’s origins and empire to be a mystery and speculate that she was Jewish. However, at the time of “Gudit”, the Shenzi Empire was the only southern neighbor of the Axumite Empire - there were no independent states between the two empires. Moreover, at that time the Shenzi Empire was ruled by a woman that the Basongora call “Kudidi”. Incidentally, Kudidi is a common name for female Basongora. Empress Kudidi is also credited with having brought the Boraana-Oromo to Axum. The Boraana share with Bahuma many spiritual beliefs, as well as words and customs – especially those relating to cattle. Empress Kudidi may have been “pagan” in the eyes of the Christians and Moslems, but her paganism had Proto-Jewish characteristics - which is in fact the case even today among the BaHuma, whose spirituality consists kosher-like dietary traditions and other ascetic practices that were inherited by the Kushites, the ancient Egyptians and the Canaanites, before they were incorporated into Judaism and Christianity and Islam. Kudidi is said to have ruled for 40 years, at the height of the Golden Age of the Shenzi Empire. The Shenzi Empire lasted another 200 years after Kudidi’s reign. The Shenzi Empire began crumbling during the reign of Emperor Ishaza, and completely collapsed around 1137 when its Axumite lands in NE Africa were captured by the Zagwe Dynasty, whereas its Equatorial territory was captured by the Chwezi Empire. The Shenzi lands on the east coast of Africa - in what is now Kenya, Tanzania and Mozambique - were taken by Lionga [also known as Ruyonga]. The Shenzi lands in southern Africa eventually fell to the Mutapa and Maravi Empires. The Shenzi Empire had been founded by a man named Twale, who most likely was serving as governor in the Axumite Empire before breaking away and forming a new state. The Shenzi Empire was founded in 630 AD out of the Equatorial and southern territory of the Axumite Empire during the reign of the Axumite Emperor named Sahama. The early Shenzi emperors have names that typically belong to the African Sabaki language communities that are resident in eastern Kenya and coastal Tanzania. Sabaki includes such languages as Pokomo, Mijikenda, Maore-Comorian, and Swahili. However, later Shenzi emperors all have names that are a mixture of Sabaki language and Rutara language communities of western Uganda, implying a gradual shift in the demographic configuration of the Shenzi ruling dynasty. Unique among all the Rutaran languages Rusongora - the language of Basongora - retains numerous, and rather old, Sabaki words and names. A notable example of the Sabaki elements in the Rusongora is the word “jenga” - meaning “to compose music” or “to make poetic rendition”. Moreover, Rusongora consists of two divergent registers, which are separate languages, one Rutaran and the other consisting of Cushitic, Nilo-Sharan and Sabaki vocabulary. The registers share grammar and syntax, but divergent content words. The name “Shenzi” itself is thousands of years old. The ancient Egyptians and Kushites referred to the Great Lakes Region of Africa as “Ta-She” meaning “Land of the Lakes”. “Ta” is a prefix - sometimes a suffix - indicating or denoting “land of”, and “She” denotes “lakes”. The structure of the name Ta-She is similar to other names given to regions in Africa by the Kushites. Sudan was Ta-Seti meaning “Land of the Bow”, Lower Egypt was Ta-Meht - meaning “Land of Flax”, and Upper Egypt was Ta-Resu. The people of TaShe were known as “She-zi” or “She-nzi” with the “zi” suffix denoting “domain of” or “element of” or “principle of”. It is certain that the people of the Great Lakes Region of Africa referred to themselves as Shenzi long before the founding of the Shenzi Empire. The founders of the Shenzi Dynasty may have given their dynasty the name Shenzi as confirmation of the fact that they were indigenous or that they were harkening back to an earlier time when things were better. It is also possible they were simply known by that name because it was the name of the region and the people. In any even, the name Shenzi has been recorded from the earliest times as the name of the peoples of the Great Lakes Region, and of an empire. The Shenzi were a unique civilization in many ways. They detested slave-trading, and rejected the religions, symbols and arts of their Islamic and Christian neighbours in Nubia and Axum. The Shenzi were good sailors, and controlled shipping on both the equatorial and southern African coasts of the Atlantic and Indian oceans. In addition, the Shenzi were cattle-breeders, and kept large herds of cows in different parts of the African interior. The Shenzi also built and maintained great forts on the African coast and the interior, and in the Persian Gulf. They used age-set cohorts in their armies; and kept embassies abroad in states as far flung as Persia and China. They also traded salt from mines in BuSongora and in Uvinza [in what is now Tanzania], as well as copper, gold, and iron. Today the word “Shenzi” survives in Rusongora as the root for the term “obweshenze” meaning “autonomy” or “independence”. “MuShenzi” in old Rusongora meant “a citizen”. In Africa, the name Shenzi fell out of favour during the colonial occupation on account of the fact that it was used as an insult by the Arabs and Europeans, and Africans came to be ashamed of it. However, in past centuries the name “Shenzi” referred to all the people of the Great Lakes Region of Africa, not just Basongora. The Shenzi Empire had been founded in 630 AD, and had its golden age lasted from about 800 AD to 1200 AD. Around 1090 AD an abdicated Shenzi Empress and ethnic Huma named Kogyere Rumeza Rusija-Miryango led a rebellion that resulted in her breaking Busongora away from the rest of the Empire and forming it into a new state. The Kogyere Epic Cycle serves as the most important narrative in the traditions of the Basongora. The centrality of this Epic in the conceptualization of the history and culture of Basongora cannot be overstated. Moreover, without it, the rest of the history of Africa’s Great Lakes Region region lacks cohesion and is incomprehensible. The Kogyere story holds a critical key place in the historical narrative of the Great Lakes Region because it provides a key to the seminal events that shaped Busongora in the 9th and 10th centuries of the Common Era. The Kogyere Epic Cycle consists of a body of narrations that form part of the living and collective memory of the people of Busongora, and provides the constitutional foundation, and the ideological structure for the social and political order of Busongora society, as well as the vehicle for transmission of the cultural values and belief systems which exist in Busongora. In fact Basongora understand themselves primarily as the “Children of Kogyere”. The most common name for Busongora used by Basongora is the epithet “Busongora bwa Kogyere” which translates as “Kogyere’s Busongora”. Kogyere is revered as the greatest ruler of the Shenzi Empire, and the founder of Busongora Kingdom its Chwezi Dynasty. Besides the name BaKama and BaHuma, the Basongora are also known by another name - BaChwezi. The name Chwezi is a RuSongora word meaning “Law-Maker” or more precisely “Decree-Giver” and “Commander”. It derives from the verb “chwa” meaning “to decide” or “to judge” or “to ban”. The word Chwezi didn’t initially refer to BaHuma exclusively, but rather to any member of the ruling elite in the Shenzi Empire. Because Shenzi Royals, administrators and commanders joined Kogyere in her rebellion against the Shenzi Emperor, the names BaChwa and BaChwezi came to signify specifically the dynasty that was founded by Kogyere in Busongora Kingdom. Soon after it was established Busongora Kingdom expanded into a large empire that covered most of northern lands of the old Shenzi Empire. The period of expansion of Busongora Kingdom has come to be referred to by Historians as the Chwezi Empire. The name “Busongora” itself initially referred to the special military district where successive emperors - specifically of the Kushite and the Shenzi Empires - sent their commanders, administrators, and elite troops, for training. The Busongora Military District was the core area of the Shenzi province of “Imara”. After the Kogyere Rebellion, the military district became the independent kingdom of Busongora Busongora, and subsequently, the Chwezi Empire. A brief examination of the causes and course of the rebellion reveal interesting details about the politics in the African Middle Ages. Kogyere inherited the throne of the Shenzi Empire from her father Ngonzaki Bitahinduka [Rutahinduka]. She ruled the empire for about fifteen years and then abdicated the throne in favour of her nephew Ishaza Nyakitooto. A rival for the throne of Ishaza was named Ruyonga [aka Nyamionga], who is known among the Sabaki speaking people of the African east coast as “Liongo”. In the end it was a courtier Bukuku who usurped Ishaza’s throne. According to Songora lore, after Ishaza lost his throne, he was imprisoned by Ruyonga. Moreover, Ishaaza is said to have married Ruyonga’s daughter – Nyamata. However, Nyamata appears to have been an empress in her own right in southern Africa, and has places in the region named after her. The Liongo Epic - a narrative important to the history of the Proto-Meru and Sabaki peoples of the East Coast of Africa - shares important details with the Kogyere Epic. At some point about 200 or 300 years after the events in the narratives took place, the details in the two narratives diverged as each community sought to emphasize some elements and neglected others. The main difference between the Kogyere Epic and the Liongo Epic is that in the Liongo Epic the person of Liongo is a composite of Isiimbwa [Ishaaza’s son] and Ndahura [Isiimbwa’s son] of the Kogyere Epic. Moreover, the person of Hamedi - a.k.a Daudi - in the Liongo Epic is a composite of Kogyere’s Ishaaza and Ruyonga. Nonetheless, the Liongo Epic confirms key events described in the Kogyere Epic, even though in the Liongo Epic the “baHuma” are referred to casually “Heathen Galla” and some key characters common to both epics are described without giving their names. A careful study of the two epics also reveals that they share important doctrinal exegesis related to the Mwari Cult - which spread from southern Africa to central Africa around 1000 AD, during or shortly after the Kudidi’s reign. Moreover, both epics provide an abundant amount of information about origins of the Boraana-Oromo, and of other “Galla” pastoralists now currently living in north Kenya, Sudan, Somalia and Ethiopia. The name Galla was applied to Basongora by Arabs and by Europeans during the colonial occupation, and it is certain that the Borana and the Basongora had relations in the past owing to the correspondences in the languages, history and social practices. However, the Basongora also share commonalities with the Proto-Luo, and with the Proto-Fulani, as well as with many other cultural communities across Africa. It is not necessary to discuss further in this article the origins of the Oromo and the Sabaki. In any event, both the Kogyere Epic and the Liongo Epic describe events that brought an end to the Shenzi Empire at a time when the empire was losing territory to Islamic and Christian forces. However, even after the Shenzi Empire fell apart, many Africans continued to look back to the Shenzi Era with pride. As recently as the late 1800s people in East Africa still referred to themselves as WaShenzi. In Haiti, descendants of African captives still venerate Shenzi spirits [also known as “Zenj” or “Lwa”]. The Shenzi Empires process of collapse was dran out over the reigns of two kings – Ishaza and Bukuku. During Bukuku’s reign – around the year 1090 - the former Empresss Kogyere came out of retirement and led a massive rebellion by the royals and nobles pf the Shenzi Empire that resulted in the creation of the independent break-away state of Busongora. After its formation, Busongora grew rapidly into an empire that is now referred to as the Chwezi Empire. The Chwezi Empire occupied the Shenzi territories in Central Africa – and reached its maximum size during the reigns of the emperors Ndahura I Ruyangye kya Rubumbi [around 1140], Mulindwa, Wamara Bala Bwigunda, Kyomya II Rulema, and Kagoro. At the height of its military power the Chwezi Empire included all of the region that is now Uganda, Tanzania, Rwanda, eastern Congo, south Sudan, and western Kenya. Kenya - the ancestral home region of President Barrack Obama - still bears proof of the reach of the Chwezi, in the such place names as “Kogelo” [named after Kogyere] and Nyangoma [named after the Princess Royal of the Chwezi Empire under Ishaza]. However, the Chwezi Empire suffered climatic disasters and economic decline and became precipitously unstable during the reign of Emperor Kagoro. Kagoro was followed on the throne by the Prophet-King Kakara-ka-Shagama. Kakara-ka-Shagama had troubled relations with the Chwezi Imperial Parliament that was dominated by priests and military commanders. Kakara-ka-Shagama eventually abdicated the throne in favour of a princess named Kamaranga. Kamaranga took the regnal name Njunaki – a name meaning ‘what have I to save?’ - and oversaw the orderly disbandment of the Chwezi Empire, as she deliberately went about creating autonomous states out of its territory - in an effort to prevent anarchy and war. The core of the Chwezi Empire - Busongora - reverted to being a regular kingdom rather than an empire, under the king Shagama - Njunaki’s eldest son. Under the Shagama, Busongora included parts of what later became the kingdoms of Bunyoro, Toro, Buganda, Mpororo, as well Rwanda, east Congo, and part of south Sudan. However, Busongora lost much territory in 1400s, mostly due to civil war and the instability caused by increased Arab and Nubian slave raids, as well as pressure from climate instability and famines. By the start of 1894, during the reign of King Kaihura, Busongora had been reduced greatly but still covered Virunga National Park in the Congo, and part of west Uganda including all of Queen Elizabeth National Park, all of Kibale Reserve, Imaramagambo Forest, western Mubende, all of what is now Toro, Kitagwenda, Kyaka and Mwenge, Shema, Bunyaruguru, as well as all of what is now Kasese district. The creation of Toro later in 1894 reduced Busongora further. Between 1910 and 1912 Busongora territory was dismembered entirely and annexed to Buganda, Bunyoro, Toro and Nkore. I should clarify that the kingdoms of Karro-Karungyi [Nkore], Burundi, Rwanda, Karagwe, Muwhawha [Buganda], and Bunyoro [Kitara], were all formerly part of Busongora’s Chwezi Empire before they broke away, each one at a different time. Nkore, Karagwe, Rwanda and Burundi were formed out of Busongora around 1300 by the sons of Songora Empress Njunaki Kamaranga. Buganda was formed around 1400 out of the territory of Muwhawha by Kato Kintu - a prince from Kiziba in what is now Tanzania - with the help of a Musongora prince named Ganda Warusiri. Bunyoro was a province of Busongora-Chwezi kingdom, until a MuSongora prince named Rukidi Mpuga - son of the 19th king of Busongora, Kyomya III - revolted and made the Bunyoro territory independent about 25 years after the formation of Buganda. The first Toro Kingdom was formed in 1830 - out of the territory of Bunyoro - when a Nyoro prince named Kaboyo led a revolt that created the new state out of four counties of south Bunyoro – between south bank of river Ntusi-Kabi [Kafu] and the north bank of the River Muzizi. The first Toro was destroyed and re-absorbed by Bunyoro in 1875. The second Toro Kingdom was created in 1894 by Major Roddy Owen out of the northern territory of Busongora-Chwezi Kingdom, along the Mpanga River. After the reduction of the Chwezi Empire, the use of the name Chwezi continued to refer to Basongora exclusively - until recent decades when it has increasingly been applied to shamanistic cults in Uganda. Whereas these cults incorporate the veneration and mystification of Bachwezi, they also tend to obscure their historical existence as real people with living descendants. The colonial occupation of Busongora after 1891 created a new and fragmented oral tradition about the founding of African civilization, dismissing the existence of empires and states and reinterpreting military and trade movements as clan dispersal or incidental migration. The histories of these “clans” typically describing the travels of a hereditary or heavenly founder and his followers from an origin point to their final villages, replaced in many areas the history of the empires and states. Throughout history Busongora Kingdom was an elective monarchy. Moreover, it was common for monarchs to retire rather than to die in office. With the exception of the Emperor Mulindwa, all of the monarchs of Busongora’s Chwezi Empire retired as honored Royals. A king or queen that has retired [ku’e-gorormora] is known as “Mu-Jwera” in Rusongora. The most militarily aggressive of the Basongora rulers – Ndahura Ruyangye I cya Rubumbi - voluntarily retired to Rweisamba, on top of the hills overlooking Lake Kikorongo in what is now Kasese District. When he died, Ndahura I was buried on Irangara Island, on Lake Matsyorro [what is now Lake George] in Busongora County. The culture and spirituality the ancient Basongora included such things as: sacred-kingship, sacrosanct-cattle, belief in a robust after-life that includes the physical engagement with the mundane world, milk-offering, rain-making, sacred groves, smoke and censer cleansing rites, fire-mounds, iron-purification, copper-crowns, marine shells, Huma hieroglyphics, mound-burials, megaliths, ritual-bathing, dietary restrictions, checker-board and numerological prognostication or divination systems, fractal-geometrical architecture, crystallography, and the use of lunar-stellar calendrical systems. In conclusion, the language - names and words - that our ancestors left us contain codified information that we can use to reconstruct knowledge and history. It is still possible to access textual records and oral traditions, relating to the ancient Basongora, and to draw from them guidance as to how to properly preserve our spirituality, language, and traditions. We can draw from Busongora’s rich - and inspiring - past, many lessons that can help us to improve our lives. Moreover, we should be able to enjoy the charm and beauty of our ancient art-forms and language, and take benefit from the productive and nurturing traditions that our ancestors have created for us.